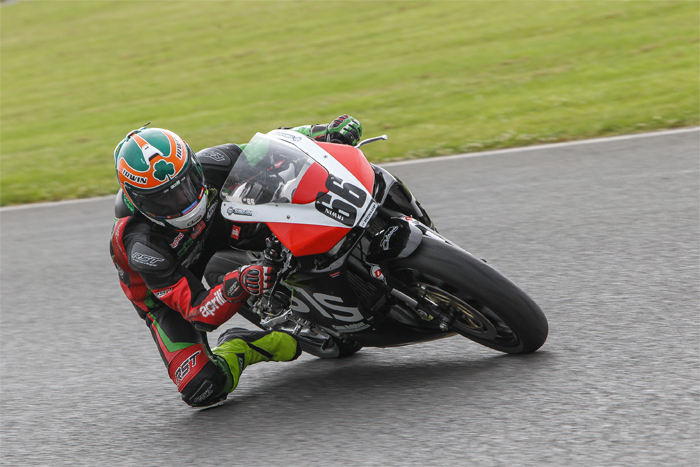 A debut appearance at Mallory Park brought Irish Motorcycle Race Team ‘Irwin Racing’ yet another race win as they continue their first season in Thundersport GB. This time it was Rhys Irwin who tasted victory to add to the two wins already achieved by his older brother Caolán earlier in the season. Having just completed his Junior Cert exams Rhys had to undertake a last minute dash from Donegal to Mallory, but dealt with the pressure well to qualify third for the first of four Aprilia RRV450GP races. A good performance in Saturday’s opening encounter saw the Oasis Bar Letterkenny and Clean Rubber sponsored rider improve his lap times by almost a second to take his first podium of the weekend, which he then followed up with a second later that afternoon. Sunday’s race three began with a wet but drying track and Rhys put in his strongest ride of the season so far, to improve his lap times once again, taking fastest race lap on his way to his first Thundersport win of 2017. The final race of the weekend saw Rhys go even quicker on his way to a close second place finish, which was enough to move him up to second in the points while closing the gap to the series leader. In the Supersport Elite class Caolán Irwin was also on his first trip to Mallory Park and overcame his lack of track knowledge to qualify fourth, less than a tenth of a second off a front row start. A strong run in race one would come to nought however as a jump start penalty dropped the Oasis Bar Yamaha down to ninth at the flag. Starting sixth for race two Caolán battled hard to move up to fifth at the flag as his lap times improved dramatically. With race three starting with the same order as race two, Caolán again had to battle hard to move up from sixth. Continuing to improve the Irwin Racing machine was on the verge of finishing the weekend with a podium when a tyre issue in the latter stages saw him drop off the pace to finish fifth. “That was another strong weekend for us on a new track and I’m delighted to get my first Thundersport win of the year.” said Rhys following his final podium of the weekend. “Due to my exams I could not travel with the team so I have to say an enormous thank you to Wesley from our sponsors Clean Rubber who drove from Sligo to Donegal to collect me straight after my exam, took me to the boat and then drove through the night to get me to Mallory Park. We made some major suspension changes over the four races and I’m much happier now and really looking forward to Rockingham at the end of July”. Caolán Irwin was also happy with his weekend despite the lack of podiums. “Once again this weekend we have shown we have the pace, although things did not go quite as we had planned. I’m happy that we picked up more championship points and I’m really happy with my times as I was just 0.8 of a second off the lap record held by World Supersport racer Luke Stapleford. After another strong weekend we are still in the hunt for a top three championship finish with just under half the season left to go”. Irwin Racing’s next event will be a return to the Masters Superbike Championship at Mondello Park on July 15th and 16th where Rhys will be looking to continue his winning run in the Lightweight Supersport Class and Caolán will be out to add to his two Supersport ‘Cup’ victories from his last Masters appearance. Following the Masters, the next Thundersport GB rounds will take place at Rockingham on July 29th & 30th.